Even though fine dining is usually the hallmark of a great restaurant, some locations give an unforgettable ambiance also. 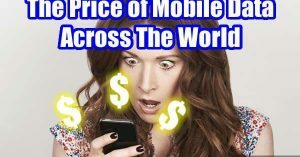 From locations in some of the most iconic or exotic places in the world, for example, on top of the Rocky Mountains or the Eiffel Tower, to a castle made of snow or a cliff in Italy, there are specific restaurants that should be visited besides for food. 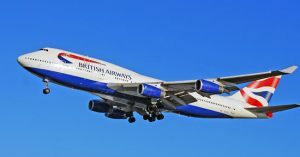 They are visited for their unforgettable surroundings and locations. Listed below are 10 restaurants around the world that will not only please our guests’ taste buds but also give out a amazing, once-in-a-lifetime experience. The world’s most unique concept of barbeque might be offered in this restaurant. 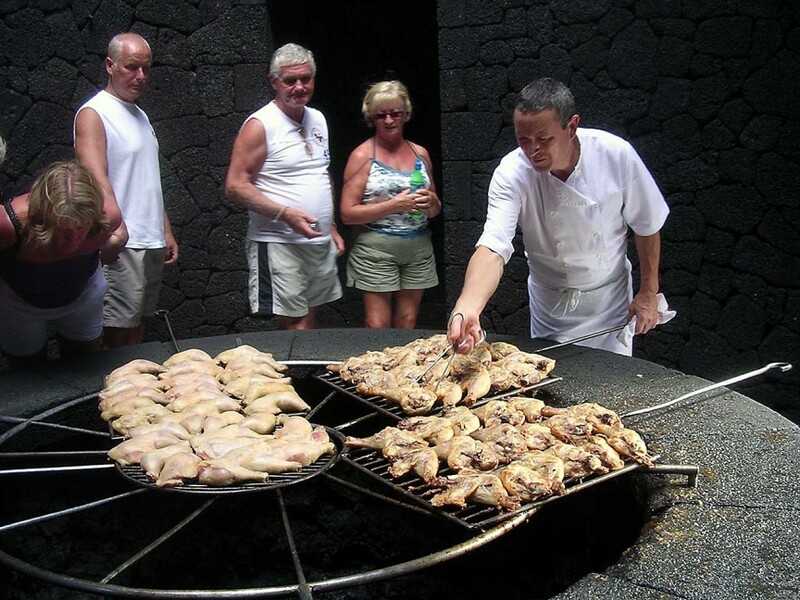 The food that is made here is cooked using heat from an active volcano 6 feet below the kitchen. 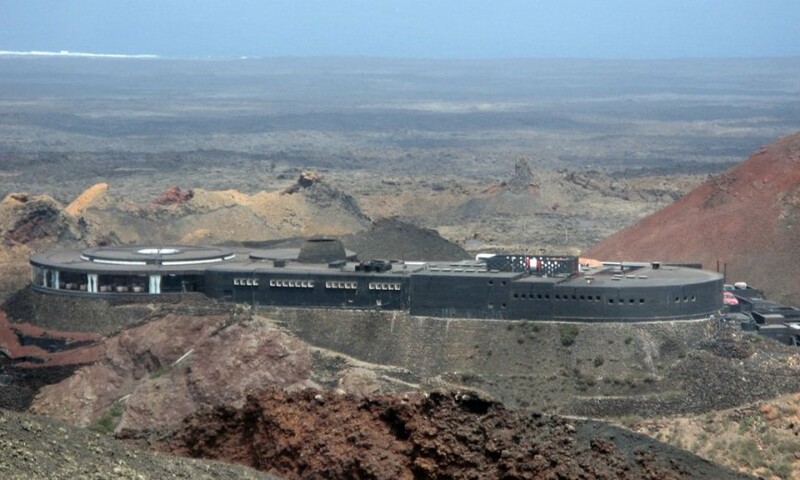 The restaurant was built on 6 layer of basalt rock to make sure that their patrons are safe (and besides, the volcano has not erupted since the 19th century). To add to the chefs’ novel food preparation technique, the views from the restaurant of the surrounding volcano and the red landscape of Lanzarote’s Timanfaya National Park are also spectacular, mainly at sunset. This restaurant has a historical and unique setting. 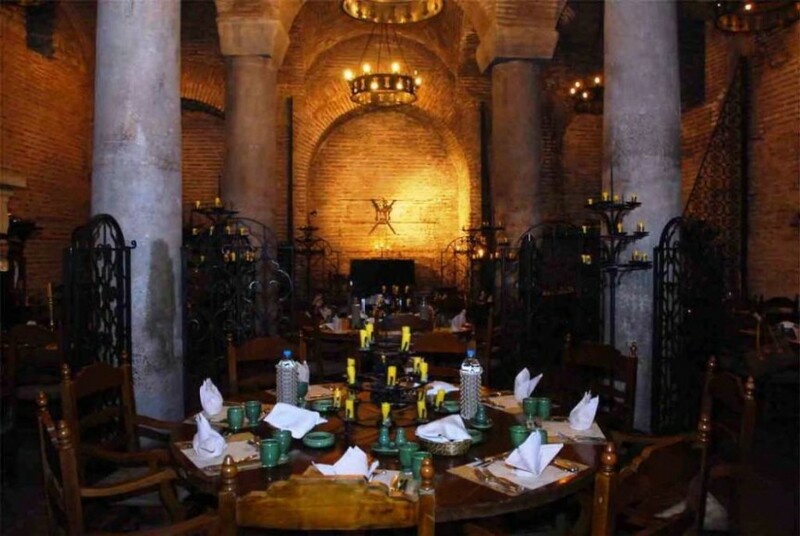 The dining area is found in a 1000-year old Roman cistern, gently lit by iron chandeliers. The ceiling is supported by six stone piers, and it is round. It is found in a historic part of the city, at the top of a hill at the end of a narrow Ottoman-style street, behind the St.Sophia. This means that apart from the ambience being spectacular, it is also quite educational, as it highlights the city’s diverse history. Sarnic offers live music and offers classic food from the region to its guests. This restaurant’s location is in the tropical paradise near the charming Layan Beach in Phuket, Thailand, perched on top of a hill with a view of the nearby Andaman Sea. 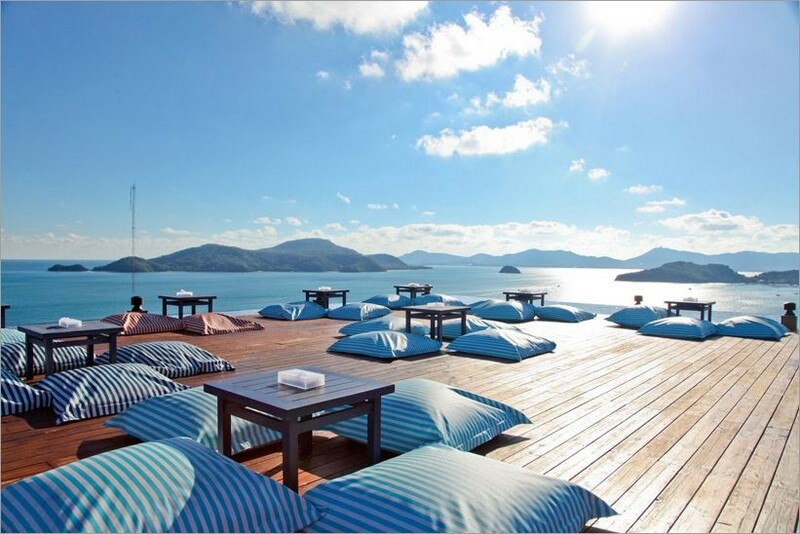 As the name of the restaurant may say, drinks and dinner can be enjoyed while overlooking unbelievable, 360 degree views of Phuket as the sun sets. The view is also beautiful and relaxing while it is day, since visitors can look out at the ocean and lush greenery underneath the tropical sun while enjoying a specialty cocktail. The quality of the food is said to equal the quality of the restaurant’s views: the presentation of the food is exotic and wild and features fusion flavours from around the world. 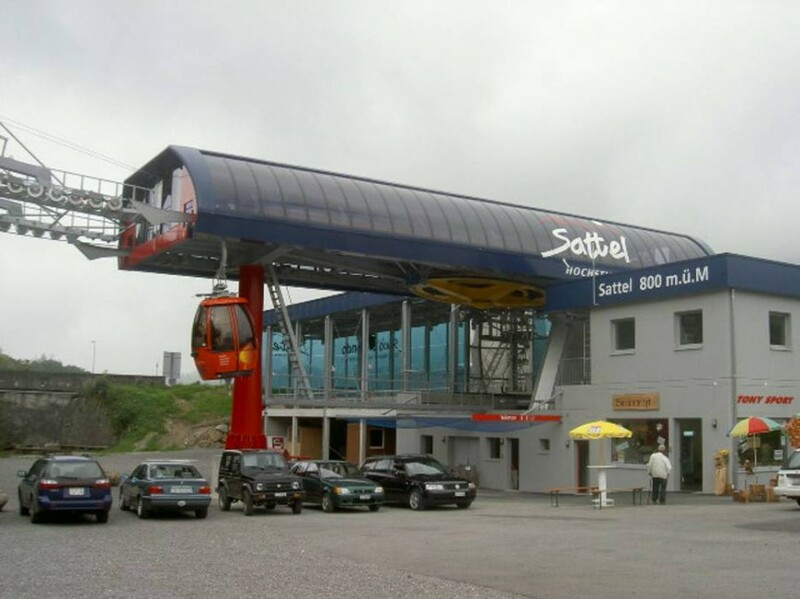 Amazing views over the Swiss Alps can be enjoyed from the mountain tops in a specially-equipped revolving ski gondola. The views in this restaurant are endless; visitors can look at the sunset over the mountains while being served an appetizer, main course and dessert in the cosy gondola. 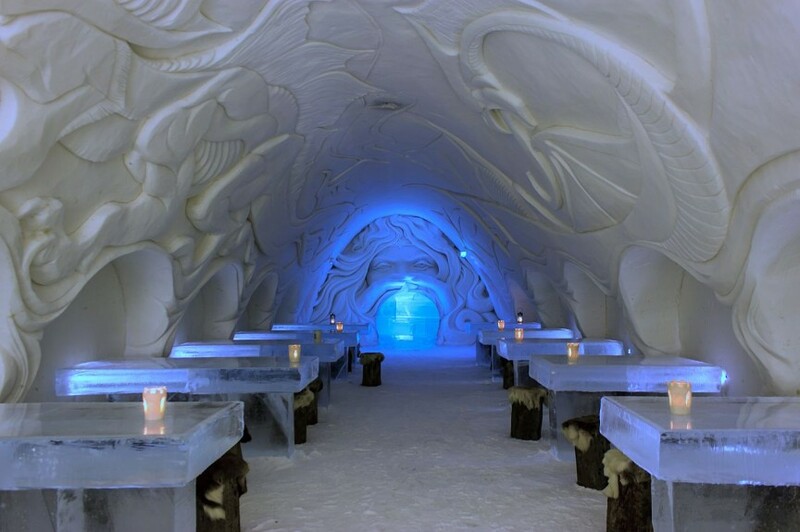 Hotels carved from ice and snow – and their equivalent restaurants and bars also carved out of ice – have become a trend in recent years, showing up in a lot of cold countries over the winter months. One of the most famous “snow” hotels and restaurants is found in Finland. The Snow and Ice Castle restaurant in Finland is built again every year and opens for the winter season around the end of January, with exclusive features and ice sculptures that change year to year. Patrons can dine in the restaurant in temperatures that are kept around -5 Celsius (chairs carved from ice are covered with furs) and at the same time enjoying the establishment’s regional-inspired specialties such as perch or salmon. 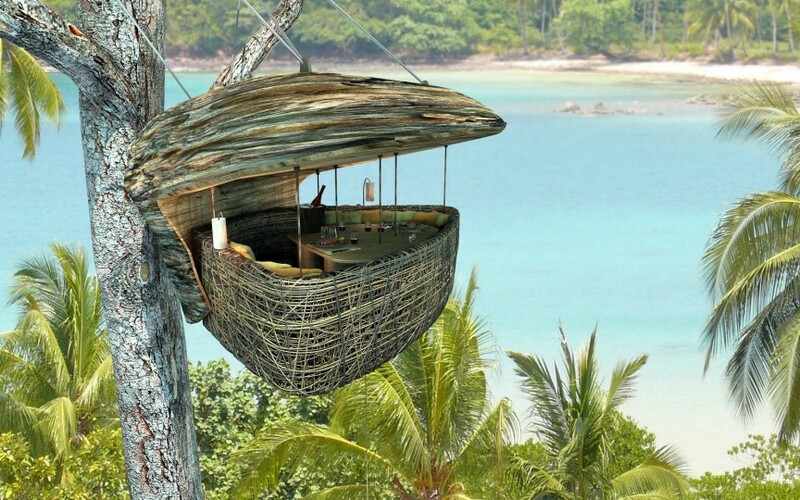 Soneva Kiri’s dining experience is a bit odd: patrons can dine in a private woven bamboo pod suspended 16 feet up in a tree. The dining experience in a treetop pod is a little bit like a childhood fantasy: guest can imagine that they are actually living in a tree house, for just a little while. Guests are seated in the pod to get to the tree house. The pod is then carefully hoisted into the tree. 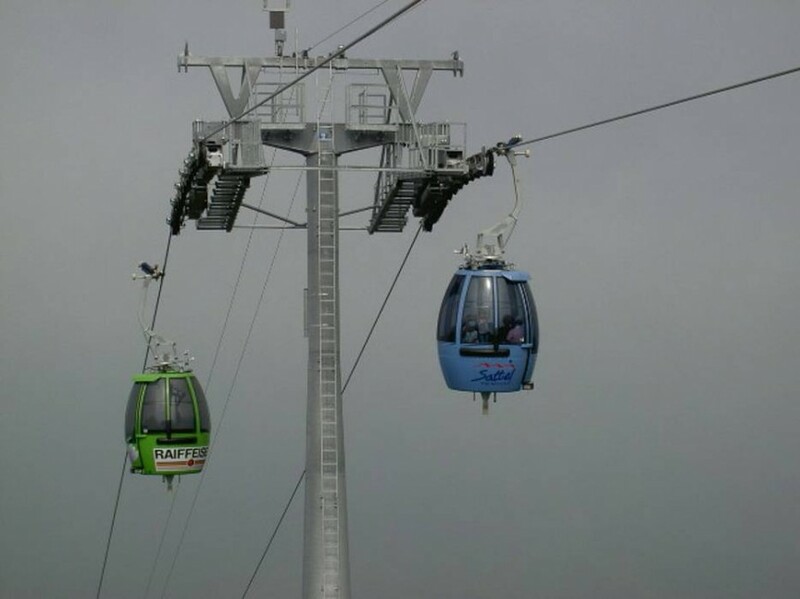 As they are enjoying gourmet food, they will be served with personal waiters who get to the pod through a zip line. The pod hangs over the amazing surroundings of the area’s tropical vegetation and the nearby aqua blue coastline. 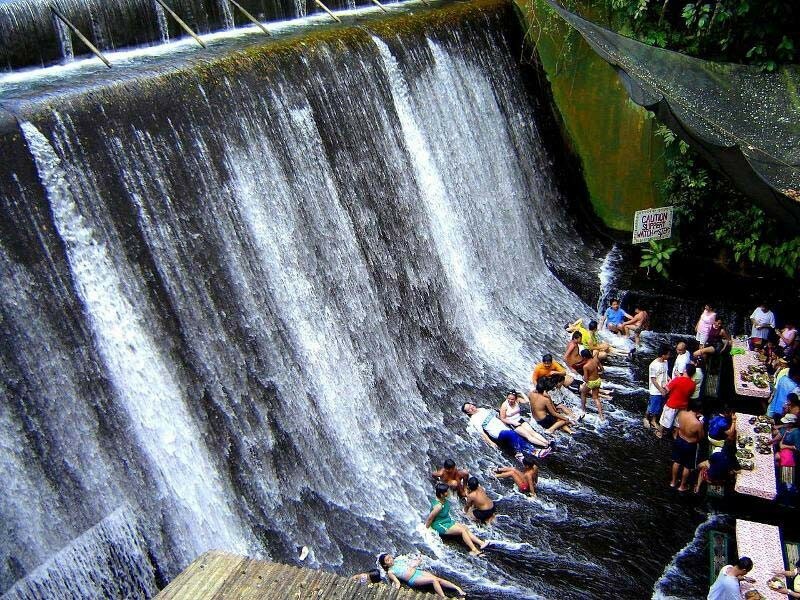 This restaurant offers lunch to patrons who are actually seated at bamboo tables found directly in the spillway of a dam. The relaxed atmosphere permits guests to hang their feet in the water as they enjoy their meals in this exotic setting. 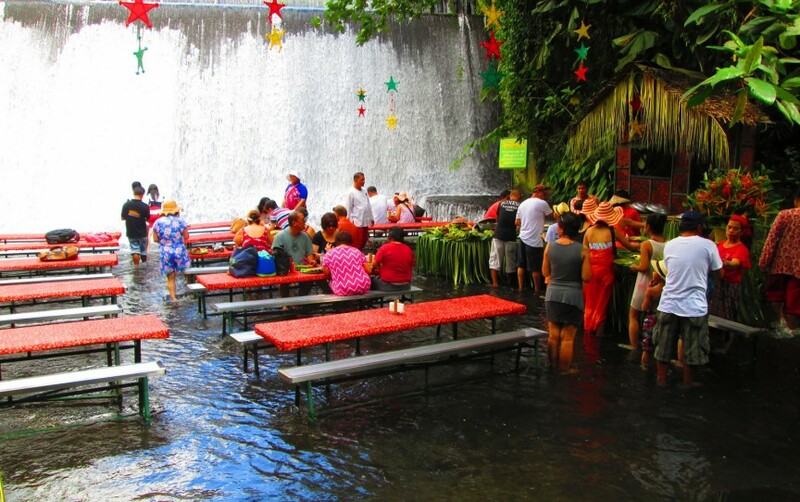 Sadly, it is not a natural waterfall; however, the sparkling waters and surrounding lush green forest still offer a scenic and memorable natural location to have lunch. The food at this rural location features local Filipino cuisine, including fruits and fish served buffet-style. This restaurant is definitely more luxurious than a carnival Ferris wheel: the Singapore Flyer’s Dining gives dinner guests amazing views of a sunset over Marina Bay Sands. It is the world’s largest observation wheel. 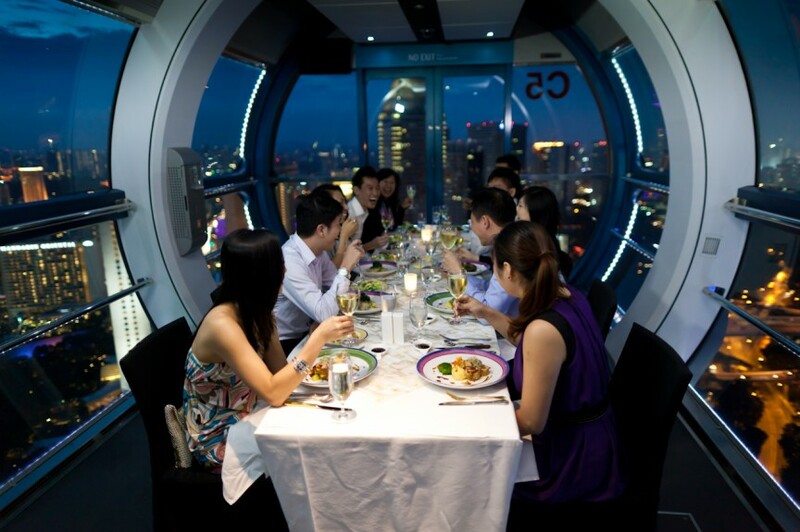 If comes with a VIP dining service to guests, who board a semi-private dining capsule. You will enjoy your multi-course meal as the sun sets over the outstanding panoramic views of Singapore. The rotating wheel moves slowly enough so that patrons do not feel the movement as they enjoy their meal. 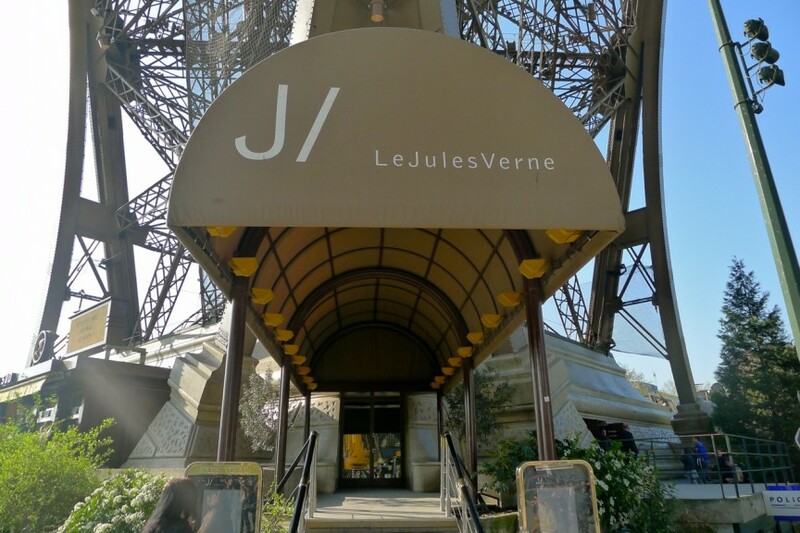 Le Jules Vernes is found in the Eiffel Tower, one of the most iconic places in the world. 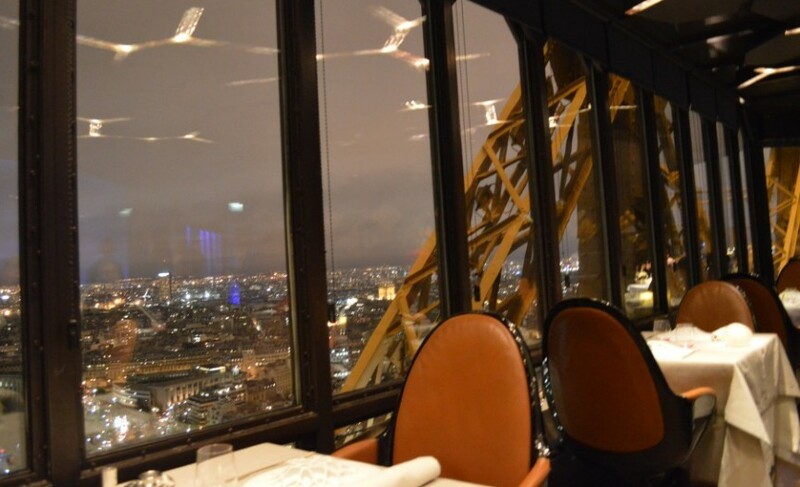 Found on the tower’s second level, the dining room of Le Jules Vernes has views of the surrounding city. Dining at this restaurant might also be one of the more relaxing ways to visit the attraction: guests can ride a private elevator, avoiding the crowds and long waits. The food that is run at the fashionable restaurant – run by Alain Ducasse – is classing French cuisine, including multi-course meals paired with wines. 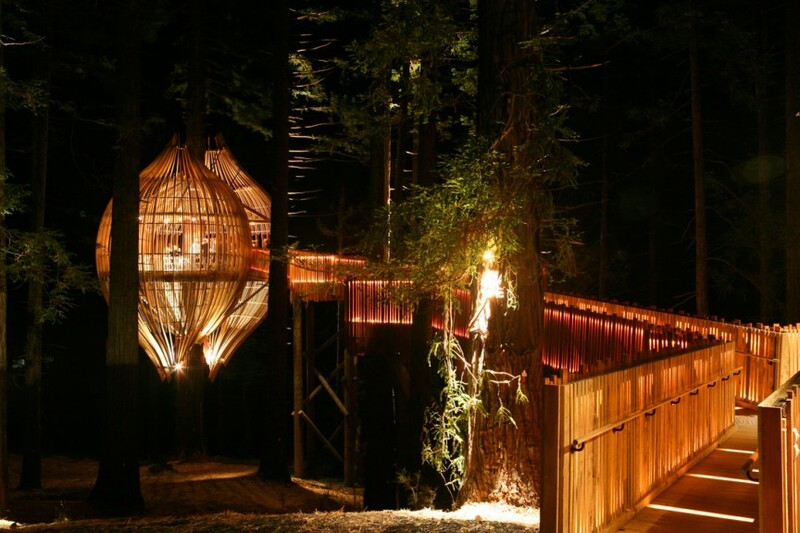 Another restaurant that draws upon the unusual concept of dining in a tree house, the Treehouse restaurant in New Zealand gives guests stunning views from the tree-tops of a forest. Patron can enjoy fresh, seasonal foods as they are served in a distinctive pod-shaped dining room that is hanged 10 meters high in the trees. This restaurant is found amongst a wilderness setting approximately 45 minutes from Auckland, New Zealand. This architecturally very unique restaurant has views which are astonishing during the day and the pod itself is at night, it is lit beautifully. 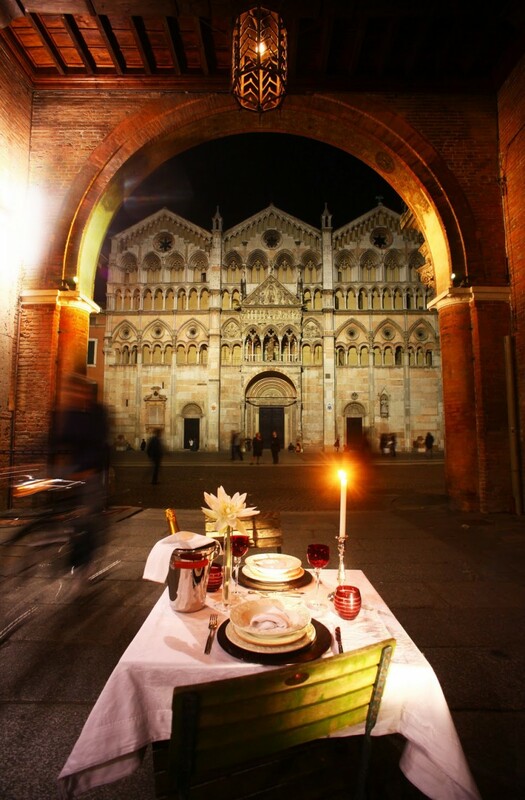 This stylish, secret and romantic outdoor pop up restaurant – called Street Dinners – has been arranged once a year in Ferrara, Italy. 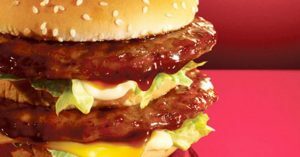 (The fifth “pop up dinner” will take place in September.) Those who wish to be involved in the experience buy a ticket which includes aperitifs, chairs and a table, and two dinner menu choices. 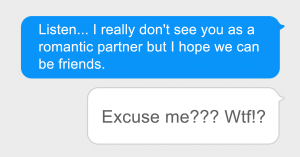 Gust must give their phone number since the secret location where the dinner will take place is announced at the very last minute through text message and Twitter. Participants will receive three messages: the first text message says where the aperitifs will take place, and then instructions are given about where to pick up the table chairs, place setting and the selected dinner an hour before dinner. Lastly, a third text message tells patrons where the meal will take place. The unusual concept has become a massive hit. The dinners normally take place in a scenic location and come with entertainment and music. This Southern Italian restaurant is open only during the summer months. 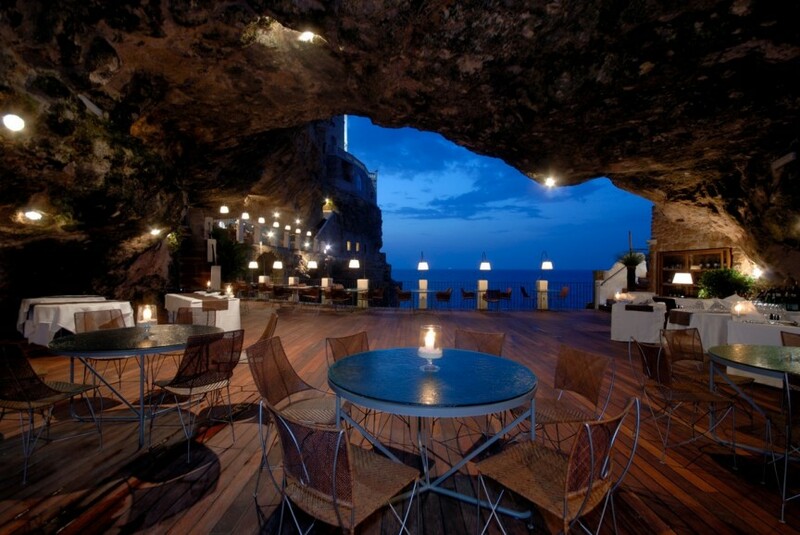 Patrons can enjoy fantastic views of the Adriatic Ocean from inside a limestone cave. This unusual setting, down the rocky shores of Italy’s scenic and historic coast, is almost something out of a fairy tale – or a sleek James Bond movie set. If patrons to the restaurant time their visit well, they can also enjoy an amazing sunset and then at dusk, the deep hues of the gently-lit dining area will be complimented by the crisp, sparkling blue waters of the ocean outside. 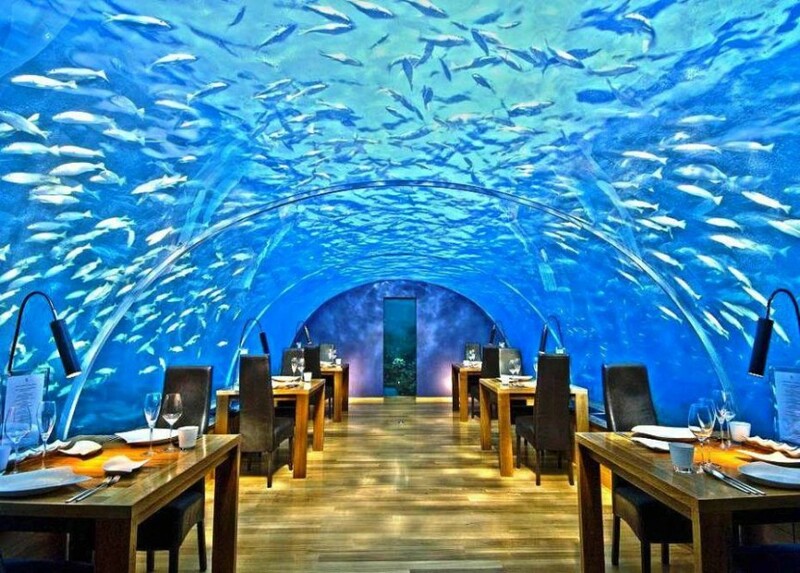 The Ithaa Undersea Restaurant has been called the most beautiful restaurant in the planet, and for good reason: found 5 meters or about 16 feet below sea level, this restaurant is literally found underwater in the blue water of the Maldives. Its dining room which is surrounded by a glass ceiling and walls, allows guests to see panoramic views of the vibrant waters, coral reefs and schools of fish, sharks and other natural ocean life that will swim around peacefully as patrons enjoy a multi-course meal. The exclusive restaurant serves lunches and dinners that highlight modern European cuisine, for example delicacies such as caviar and lobster. 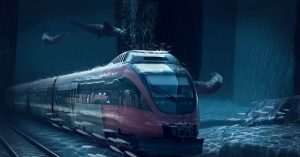 The food and drinks are luxurious, however, the real draw is of course the magnificent undersea views.